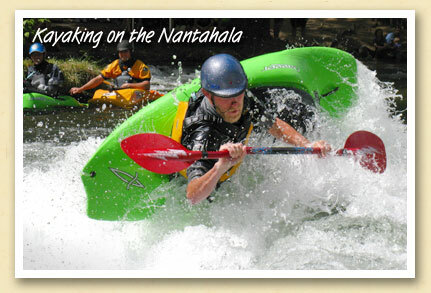 Best known for whitewater rafting, the Nantahala River is now the focus of a different group of paddlers — the world-class athletes who will compete in two upcoming international events to be held in the Nantahala Gorge. In 2012, a Junior World Cup Freestyle Kayaking competition will be held on the river. And that’s merely a warm-up for the World Freestyle Kayaking Championships, which will focus worldwide attention on Bryson City and the Nantahala River Gorge in 2013. This week’s postcard, a photo entitled “Cartwheeling” by Erin Worley of Bryson City, captures a paddler performing an acrobatic maneuver typical of freestyle kayaking. It also captured the third place in the Marianna Black Library’s “Life in Swain” photo contest. To learn more about freestyle kayaking, visit the International Canoe Federation’s website.